Prescription Drug Errors in Nursing Homes Lead to Harm | Kennedy Hodges L.L.P. When a person is no longer able to safely care for himself or herself at home, it may be necessary for an admission to a nursing home. When living in the nursing home, the person is under the care and supervision of the nursing home staff. This means that the nursing home is in charge of overseeing the patient’s medication use and administration. Errors during this process can lead to significant harm in patients. An event occurs that may cause or lead to inappropriate medication use or patient harm. The medication was in the control of the health care professional, patient or consumer. The error was related to professional medical practice, health care products, medical procedures, medical systems, prescribing of medication, order communication, product labeling, medication packaging, medication compounding, medication dispensing, medication distribution, medication administration, medication education, medication monitoring, and medication use. Unfortunately, these medication errors can occur in many different settings, including nursing homes. How Do Medication Errors Occur in Nursing Homes? A nursing home employee crushes or slices medication that should not be split. This could include capsules, tablets, or any other type of medication that contains “do not crush” instructions. The nursing home gives the patient medication without accompanying the medication with adequate fluids. Many medications commonly taken by elderly patients contain explicit instructions that they should be taken with fluids. This may result in harm to the patient. The patient is given medication to be used with enteral nutritional formulas in an improper manner. Many elderly patients require this nutrition, and often require medication as well. When combining the two, nursing home administrators must use caution to prevent errors that could lead to harm. 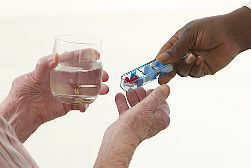 The nursing home employee administering the medication to the patient fails to properly shake, mix, or roll the medication, despite instructions calling for these actions. As a result, the patient may receive too little or too much of the medication. The patient is given insufficient food or antacids when taking medication. As a result, the patient may suffer harm. The nursing home patient requires eye drops and the staff fails to properly administer the drops. Nursing home staff must ensure that the drops make eye contact for a sufficient period of time in order for them to work. Generally, this means between three and five minutes. A nursing home employee uses a metered dose inhaler on a patient improperly. These inhalers must be properly shaken and positioned in order to be effective for the patient without causing harm. In addition, staff must wait approximately one minute in between having the patient take puffs on the inhaler in order to prevent harm. A nursing home employee allows a patient to swallow a pill or tablet that was meant to be taken sublingually. This can potentially lead to harm. A nursing home employee administers expired medication to an elderly patient. The patient is given the incorrect medication, medication in the wrong form, or the incorrect strength of medication. The nursing home employee fails to properly document the elderly patient’s medication use and administration. After administering medication to an elderly patient, a nursing home staff member fails to properly monitor the patient. A nursing home staff member gives the patient too much medication, either in the form of a single overdose or multiple doses. A nursing home staff member gives the patient too little medication or fails to give the patient medication at all. Regardless of the specific cause, if you or a loved one was injured by a medication error while staying in a nursing home, it is important to seek legal guidance in order to protect your legal rights. We are here to provide the assistance that you need. We encourage you to contact us today for a consultation at 888-526-7616.